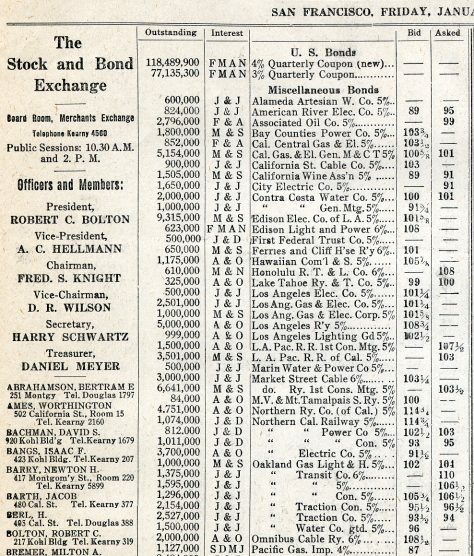 Original (Not a reproduction) Historic Price Quotation Sheet from the San Francisco Stock and Bond Exchange issued in 1910. This item is over 100 years. This closing price summary was printed on a daily basis and sent to brokers and Wall Street firms. 16" x 9 1/2". The sheet will be issued in 1910 and will look similar to the scan shown in this listing. However, the date and some content may vary. This historic item would look terrific framed. Interest in the industries that developed from mining provided the impetus for organization of the San Francisco Stock Exchange in 1882. The predecessor of what now is the San Francisco Mining Exchange was started 20 years earlier. Twenty-five brokers met on September 18 in the basement office of Wohl & Rollitz, located in the old Fireman's Fund Insurance Company building at 403 California street. It was Leader Out of that number, 19 signed the charter and deposited $50 each as the price of membership in what initially was the Stock and Bond Exchange. At the time the leading mining exchange (there were several), was the San Francisco Stock and Exchange Board. The first president of the stock exchange was John Perry Jr., who had been a member of the New York Stock Exchange and a charter member of the Boston Stock Exchange before coming West during the gold rush to try his hand at mining. Like many eastern brokers of the time, Perry left the mines for the more familiar business of securities. The stock exchange changed to its present name in December, 1927 and the mining exchange also took its present name. First location of the stock exchange was at 312 California street. Next, the "big board" of the west occupied a series of quarters in the Merchants' Exchange Building, 429 California. The exchange moved in 1918 to 341 Montgomery street; temporarily located in a one and a half story building at Montgomery and Pine, a part of the present site of Bank of America's headquarters. Then, in January, 1930, the exchange moved into its present location, the former Sub-treasury building it had purchased at Sansome and Pine, and erected a 12-story office building on adjacent property. The office building was sold in 1953 to Industrial Indemnity Company for more than $1,000,000. Exchange members never owed one dollar of debt on that building. They received a cash dividend from proceeds of the sale. Trade Declines In excess of $100,000 was spent thereafter to improve the trading floor and adjacent offices in the column-fronted Sub-treasury building. In 1929, exchange seats sold for as high as $250,000. The greatest volume of trading was handled in the boom year 1928, a total of 31,530,016 shares worth $2,066,718,634. The year of the crash, 1929, volume dwindled to 19,188,822 shares valued at $889,697,434. However, 1954 was the highest volume year since 1930 with 16,302,149 shares worth $301,744,115 crossing the board. This year's market volume is substantially ahead of 1954. Through September 19, there were 14,838,023 shares traded worth $277,022,259. This month, dollar volume for 1955 will pass the 1954 total of $301,744,115. Outstrips L.A. The San Francisco Stock Exchange provides one important reason why this city is known as the Pacific Coast's "financial capital." Its volume exceeds that of Los Angeles. Through September 19 for this year, the same period as above, the Los Angeles Stock Exchange handled 14,030,052 shares worth $242,302,070. Among the present members, Sidney L. Schwartz of Sutro & Co., is the eldest in years of membership, dating his from 1906. Bertam E. Alanson of Alanson Bros. & Co., has been a member since 1907. There is a third generation member, David Berl, grandson of a charter member and son of Edwin D. Berl, prominent broker. Ronald E. Kaehler has served as full-time president since 1943. William H. Agnew, partner of Shuman, Agnew & Co., is the 1955 chairman of the board of governors. In 1957, the San Francisco Stock and Bond Exchange merged with the Los Angeles Oil Exchange to form the Pacific Stock Exchange. The main office and trading floor was located in San Francisco and a satellite trading floor was operated in Los Angeles. Although smaller than the NYSE and NASDAQ, the Pacific Stock Exchange was a market where stocks and bonds were bought and sold. In the mid-1970s, it began trading the put and call option contract � option is a contract that gives the investor the choice to buy or sell stock and other financial assets at a particular price up until a certain time in the future. During the final three decades of the 20th century, the Pacific Stock Exchange traded more than 1,200 stock options and also became one of the world�s leading derivatives markets. In 1997, the word "Stock" was dropped from its name and it became known simply as the Pacific Exchange. Stock exchanges are private organizations own mutually by a limited number of members � usually stock brokerage and investment houses. In 1999, the Pacific Exchange became the first US stock exchange to demutualize. At the turn of the century, most financial transactions were being handled by computer � dealers and brokers no longer needed to do business face-to-face. As a result, the Pacific Exchange closed its Los Angeles trading floor in 2001; one year later, it did the same in San Francisco. In 2003, it developed an electronic options trading system. Then in 2005, the Pacific Exchange was acquired by Archipelago Holdings. One year later, it was purchased by the NYSE, essentially ending its run as a separate company.